I have very exciting news. 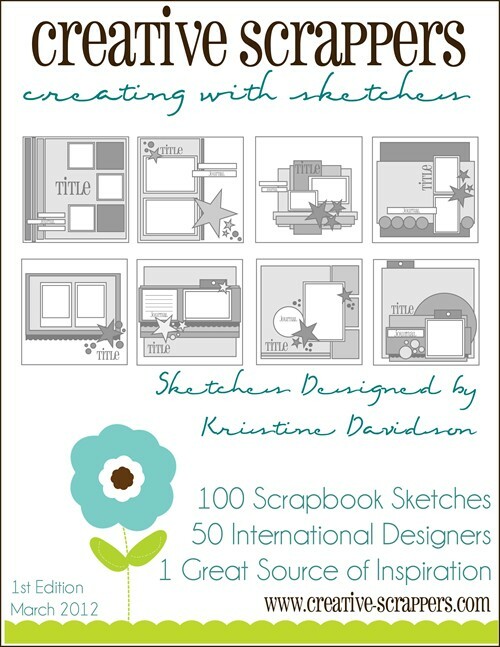 Kristine Davidson, owner of Creative Scrappers has published a new e-book “Creating with Sketches” with over 100 sketches and layouts from designers from all over the world. I was really honored that she gave me the opportunity to create a layout with one of her sketches and get published in her book. In order to commemorate this happy occasion and to celebrate the month of Love, I want to send some love your way!! 2. Leave a comment at the bottom of this post telling me why you would love to win this book. I will pick a winner’s comment that truly expresses from the heart. I will be announcing that winner on my blog, on February 14th. If you would like to buy a copy of this book please contact Kristine here and she’ll be happy to send you one. I’ve seen the book and its amazing!! There are so many good sketches and some amazing layouts made by some very talented designers. Hi Keren, well done on being a part of this wonderful publication, i usually print off the sketches that i like and put them in my sketch book as i go. this layout is truly very beautiful, so feminine and so pretty… i love what you have done with the pearls.. always love your creations.. i hope you are having a great week! Beautiful layout Keren & congrats for being part of such a great publication. Well deserved. I would absolutely love to win this sketch book because I am inspired by the creativity and talent of each artist that makes these sketches and ideas, to me a sketch is like a house plan you see it on paper and follow it, but once you construct it, it becomes your own masterpiece. Thank you for the opportunity to win this ebook and congratulations on your publication. Congratulation!!! That is amazing! Your L.O. is so romantic and has a perfect balance! This is the style I prefer…well…about the e-book…I'm a new scrapbooker, and until now…I was only cardmaking! Until now I have done only 5 L.O.!! !I really need it..to be inpired and work on these sketces! Thans for the chance…and congratulations once more for being published! !Hugs from Greece! !